Hello everyone! Welcome to Day TWO of our February Krafty Peeks at Kraftin' Kimmie Stamps! 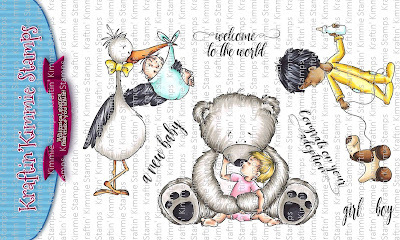 Today we have another precious stamp set to share with you, this time from artist Cheryl Grant and it's called WELCOME TO THE WORLD! You will see this adorable set in action as you hop with the Krafty Team and Guests listed below. Be sure to hop around and leave some love at each and every stop because one lucky commenter will WIN a $10 gift voucher to the store EACH DAY this week! Plus we're doing a GIVEAWAY of the ENTIRE release on the Krafty Friends Facebook Page! It is perfect for the birth of a little boy <3. 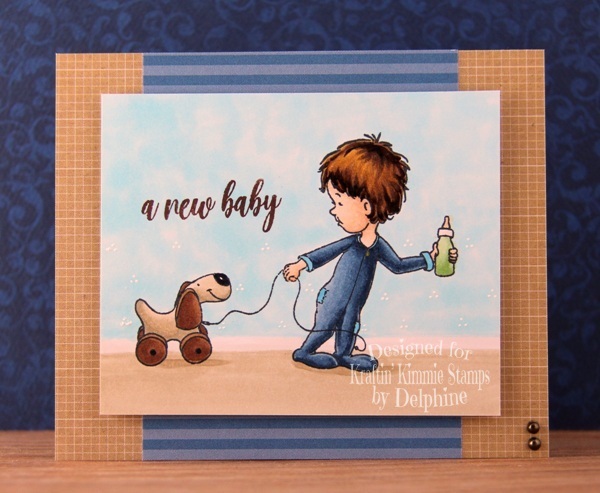 Love your simple patterns and your choice of color for a "male" card. Just adorable, your colouring always on point. Darling card! Great job on this card. This stamp is so cute. Wow it could be used with so many great sentiments.